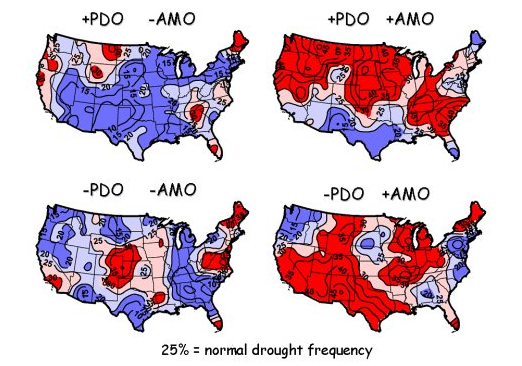 Of course both Land and Ocean temperatures are also influenced by El Nino/La Nina cycles and within a particular AMO,PDO phase, there can be several such cycles. As shown in the figure below (which uses a baseline period of 1971-2000) there have been between 15 and 17 individual El Nino cycles since 1950. Each cycle has a different duration and the time between cycles is not uniform. 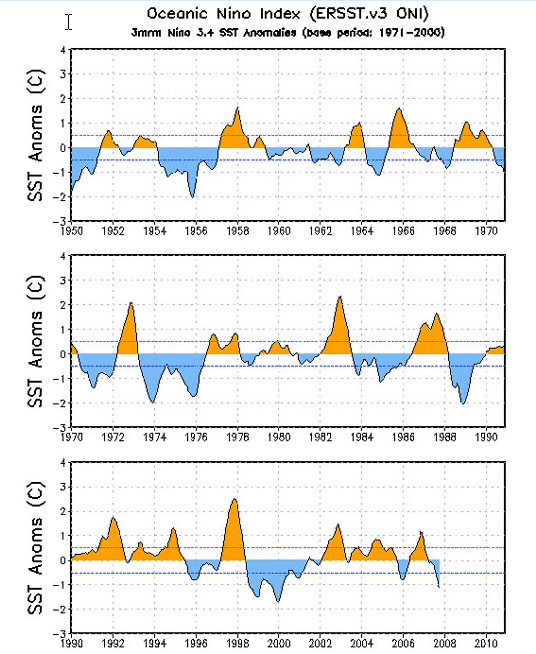 In general, an El Nino cycle occurs every 3-5 years but the behavior of the system in the early 1990s is particularly odd as there was a 5 year period of essentially continuous (but weak) El Nino with no La Nina event in between. Note that this year, 2009/2010, is currently in the strongest El Nino cycle since the 1997/98 event. Again the point of raising the El Nino/La Nina cycle is to show that we have a secondary timescale involved in our climate baseline. When represented this way, it seems clear that the El Nino/La Nina cycles are superposed on a steadily increasing slope that commences somewhere in the 1980-1985 period. The claim that global warmed stopped in 1998, as applied to this diagram shows that it also stopped in 1982, then again in 1985, and then in 1991, 1998, 2001, 2003, and 2008. In other words, we see continuous evidence of "mini-peaks" (or local maxima in the parlance of time series language) in the anomaly data which are simply smoothed over and missed when one plots annual data. On the basis of this data it would seem that we oscillate between a local maximum and a local minimum (on timescales of a couple of years) while the underlying trend is upwards and certainly not downwards. 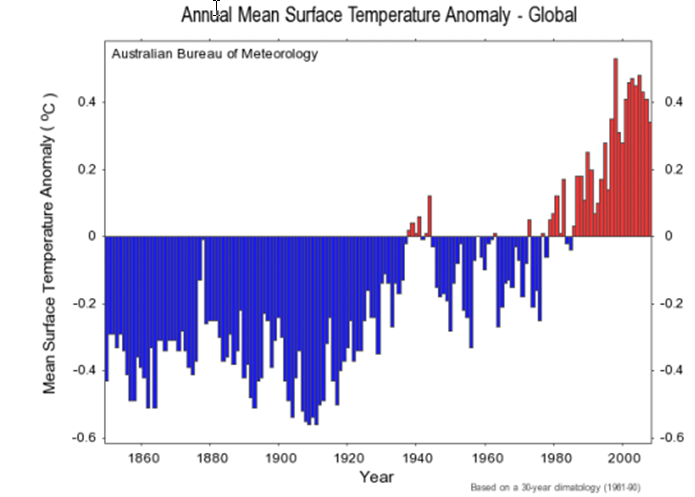 Consistent with that conclusion is the recent data from NOAA and NASA that March 2010 was the warmest March every within the time period shown above. When other factors are considered on the future amplitude of temperature increases, such as the water vapor feedback loop and the methane release of the Arctic permafrost, the argument that global warming peaked in 1998 will prove to be both erroneous and silly.